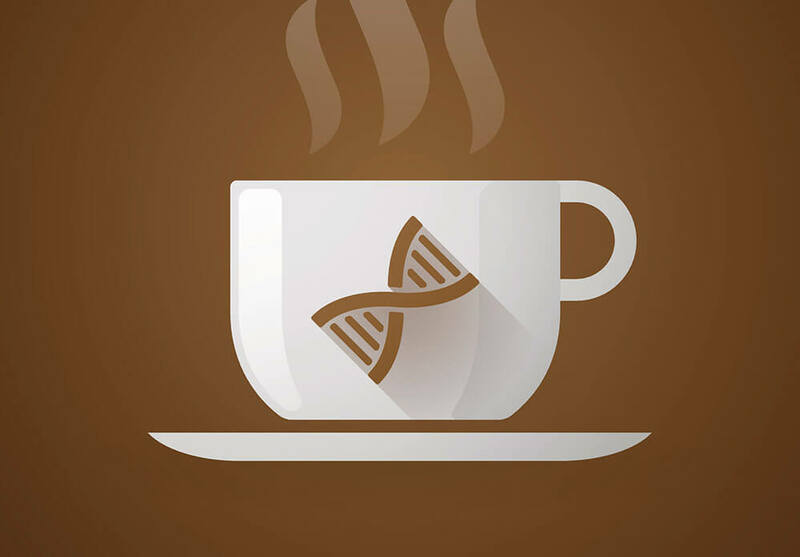 Researchers have uncovered several genetic variations that influence how we metabolize caffeine. No two people respond to drugs and common chemicals the same way. That’s partly due to our genes. Are you one of those people who can’t stand the taste of cilantro sprinkled on your tacos or guacamole? You’re not alone. About 4 to 14 percent of the population has a genetic variation on an olfactory-receptor gene called OR6A2 that contributes to the detection of the leafy green herb’s soapy smell. Turns out, small variations in our DNA called single-nucleotide polymorphisms, or SNPs (pronounced “snips”), play a role in more than just your preference for cilantro. Genetic differences also influence how we respond to certain medicines and chemicals. Ever wonder why certain people turn beet red after a glass of wine or others can drink multiple espresso shots and not feel the least bit jittery? Our genes code for the enzymes that metabolize these substances in the liver. A single SNP can lead to a deficiency or overexpression of the necessary enzyme and cause these side effects. While a multitude of factors influence how we respond to medicines and chemicals like caffeine and alcohol — from body weight to the time of day — the field of pharmacogenetics examines how a person’s individual genes can affect their response to specific substances. Such research helps experts better understand why medicine is truly personalized: Two people can take the same medicine, at the same dose, and have vastly different outcomes. Read on to learn on how genetic variations influence our response to these well-known medicines and substances. About one in three people of East Asian descent — Chinese, Koreans, Japanese, and Vietnamese — have a variation on the ALDH1 gene in the liver that causes them to experience a bright red appearance, when drinking alcohol. The enzyme breaks down acetaldehyde, a naturally occurring chemical in alcohol. But those with a ALDH1 gene variant are slower at metabolizing alcohol, which leads to a build-up of acetaldehyde in the body, leading to the bright red flush, nausea, and a quickened heartbeat. There is one positive side-effect of this genetic variation: People with this ALDH1 variant are six-fold less likely to develop alcoholism. Several genes have been found to play a role in how we process caffeine in the body. One of these is a gene that codes for a liver enzyme called CYP1A2 that determines how fast we metabolize coffee. Researchers have found two variations on the CYP1A2 gene — a fast metabolizing version and slow metabolizing one. Those who inherit two copies of the fast metabolizing gene process coffee four times faster than their slow-metabolizing counterparts. The latter group, the slow-metabolizers, need to limit their java consumption because their bodies eliminate caffeine more slowly and are more impacted by its stimulating effects. Cytochrome p450 (CYP) is a “superfamily” of enzymes primarily found in our liver cells that account for about 70 to 80 percent of the enzymes involved in drug metabolism. Researchers have found nearly 60 CYP genes in humans. One of these genes, known as CYP2D6, is essential to metabolizing several types of medicines, including beta-blockers, antipsychotics, tamoxifen, and selective serotonin reuptake inhibitors (SSRIs), a class of drugs that are used as antidepressants. Patients who have genetic testing done can be put into four classes of CYP2D6 metabolizers: ultra-rapid metabolizers, normal metabolizers, intermediate metabolizers and poor metabolizers. While the impact of CP2D6 activity varies by drug, there is evidence that the observed effect of SSRIs may vary depending on which “type” of metabolism a patient has. Statins, among the most widely prescribed class of medicines, used to lower “bad” low-density lipoprotein (LDL) cholesterol levels and reduce cardiovascular risk, have wide variability in patient response. Researchers have identified four different genes that may influence their effectiveness and safety. One of these genes, SLCO1B1, codes for a protein that facilitates the uptake of statins into the liver, where they are metabolized. Variation on that gene — its alleles — can determine whether someone is a good metabolizer of these cholesterol-lowering drugs, and thus whether they’re more likely to develop varying levels of statin-induced myopathy or muscle pain. The allele that makes someone a poor statin metabolizer is more common in some geographic populations than in others, with estimated frequencies ranging from 3% in Africa to over 20% in Latin America.